After i found this strange "No-Op Garbage Collector", i was keen, if there are some other new GC features with Java 11. Below are typical GC pause times from the same benchmark. 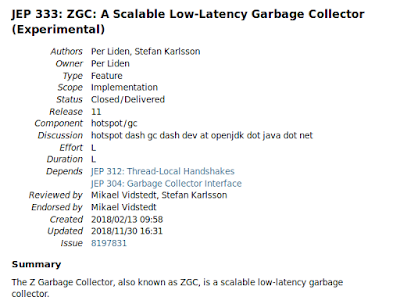 ZGC manages to stay well below the 10ms goal. Note that exact numbers can vary (both up and down, but not significantly) depending on the exact machine and setup used. The initial experimental version of ZGC will not have support for class unloading. The ClassUnloading and ClassUnloadingWithConcurrentMark options will be disabled by default. Enabling them will have no effect. Also, ZGC will initially not have support for JVMCI (i.e. Graal). An error message will be printed if the EnableJVMCI option is enabled. These limitations will be addressed at a later stage in this project.